I have to admit that so far I am not a fan of having to follow rules while on vacation. Maybe it is just me, but there seem to be ice cream shops, candy stores, coffee shops (presumably selling white chocolate mochas), and fried fish places everywhere. The people eating and drinking items from these places look like they are having loads of fun and really enjoying every bite…not that I was paying any attention. At this point I can only be thankful that my daughters have not seemed to notice (at least enough to say anything) when passing by their nemesis, which would include hot dog places and the same ice cream and candy shops that are bothering me. I suppose if I could have traveled on the plane and boat armed with my ice cream maker and espresso maker (in addition to my small suitcase that was completely dedicated to food) things would be a little bit easier. On a lighter note we have managed to get by so far without breaking any rules. The plane ride was fairly easy because I started a habit of packing our lunches for midday flights months ago…so that was nothing new. After we first arrived I felt like I could not relax until I assessed my parents’ fridge/pantry, made some granola cereal, and went to the grocery store. My mom did already buy some things we could eat which helped, but I wanted even more ammunition for the first time a child of mine said they were hungry for a snack. 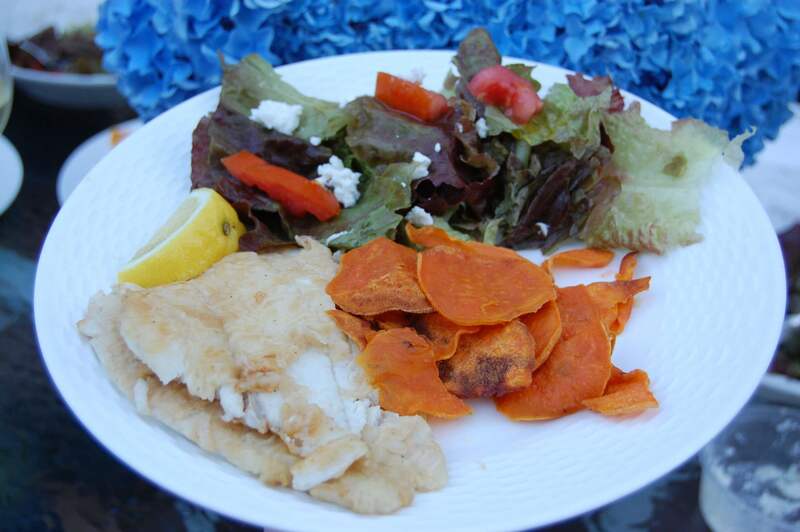 We stayed in on our first night and I attempted to make some baked sweet potato chips (they were not as good as the fried version) to go with some freshly caught sautéed fish and a salad. My younger and pickier daughter shocked the you-know-what out of me by actually eating some fish for the first time! I have no idea what got into her…maybe the planets were aligned just right or our eating habits are just starting to rub off on her by now. Our second day here started off with an uneventful breakfast of whole-wheat pancakes. Then came our first attempt to eat a meal out of the house. 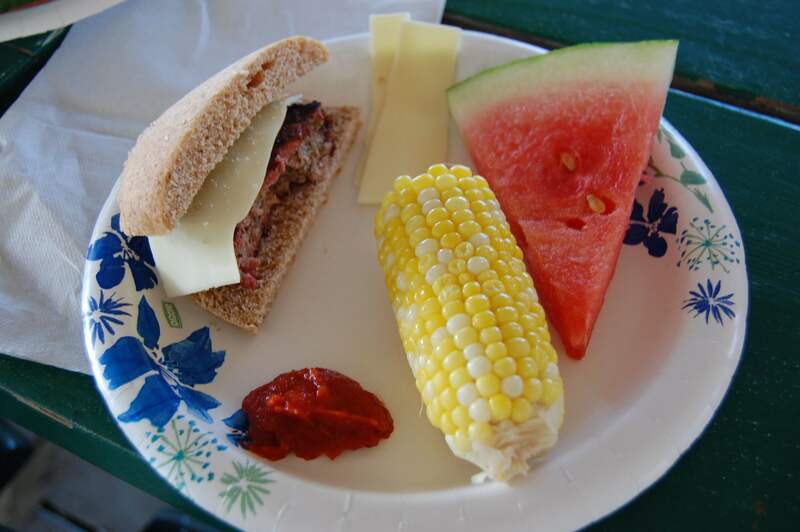 Thanks to some research we knew that a local farm’s Fourth of July BBQ would include hamburgers made from locally raised meat. We can almost never find truly 100% whole-wheat breads when we are out so one of the things I brought in my food suitcase was a pack of hamburger buns (special ordered from Great Harvest Bread Company before we left). After whipping up some mediocre tasting ketchup we were on our way. Pictured is one of my kid’s plates that I fixed from the buffet. It was actually a pretty good meal despite not being able to eat quite a few of their offerings due to other meat being from unknown sources and hidden sugars/sweeteners in some of the dishes. This just goes to show how important it is to ask questions in order to truly know what is in your food. Who would have thought that the vegetarian chili was made with molasses and the raw cucumber salad contained sugar (at a local farm of all places)? Doing this little pledge of ours certainly is an eye opening experience! Hey All. I found your website the usage of msn. This can be a quite perfectly written content. I will be sure to save it and come back to go through additional within your beneficial details. Thanks for the write-up. I’ll certainly return.